On December 6, 2017, the H.N. 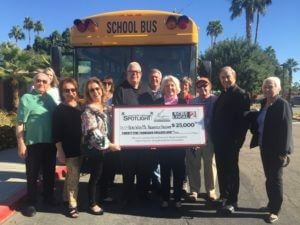 and Frances C. Berger Foundation presented the $25,000 Coachella Valley Spotlight Grant to Read With Me Volunteer Programs to continue the bus program that delivers volunteers to east valley schools to help in the classrooms. The organization will use the majority of the grant proceeds to expand the bus program to at least three more east valley elementary schools. And as the program expands to more schools, they are in need of more volunteers. Read with Me could not operate if it were not for the over 550 volunteers, many of them snowbirds. They will be using part of the grant monies for their volunteer appreciation event and to recruit more volunteers. “The schools that we focus on have a very high incidence of children coming from homes where no English is spoken. Ninety percent of the children live in homes at the poverty level. Their parents love them and work hard to provide for them but are unable to help them academically. We provide an opportunity for the children to practice their English language skills and improve their proficiency,” said Read With Me Founder, Roberta Klein. The Read With Me Volunteer Program provides provide English speaking role models for children who are in need of individual assistance in learning to become fluent in English. Volunteers are brought to schools in areas of high poverty with a majority of the parents untrained in academic English. In addition to the more than 700 hundred volunteers helping in the classrooms, Read With Me has a book distribution where they give-away hundreds books each year. “Witnessing a child getting their very first book is very rewarding. The parents in these families are working so hard just to provide basic necessities that sometimes they could use some help getting their kids quality, age appropriate books. We are happy to assist them in educating their children,” said Catharine Reed, Program Director for the H.N. and Frances C. Berger Foundation. Read With Me Volunteer program also received a Golden Bell award for English Acquisition by the California School Board Association for their work in the Coachella Valley School District. “The Coachella Valley has benefitted from the program and could be implemented in other areas that face similar challenges in providing tutoring and mentoring for disadvantaged children in a classroom setting,” said Mike Stutz, General Manager of Gulf California Broadcast Company, which owns and operates CBS Local 2. Along with the grant, Read With Me Volunteer Program was featured on CBS Local 2’s “Eye on the Desert,” in public service announcements, and on the cbslocal2.com website throughout the month of December. For more information, to sign up to become a volunteer, visit http://www.readwithmevolunteers.com.